Fine. 0316726613 ALL BOOKS SHIPPED WITHIN 1 DAY OF PURCHASE! Very Good. 0751536822 ALL BOOKS SHIPPED WITHIN 1 DAY OF PURCHASE! Very Good. 0316726613 ALL BOOKS SHIPPED WITHIN 1 DAY OF PURCHASE! Very Good. 0786868716 ALL BOOKS SHIPPED WITHIN 1 DAY OF PURCHASE! Good. 0751536822 ALL BOOKS SHIPPED WITHIN 1 DAY OF PURCHASE! Really good book. It kept my interest all the way through and really did like the ending. I would recommend everyone should read this book!!!! Very enjoyable. Mitch Albom has a lot of experience with writing. He is a best-selling author, journalist, screenwriter, playwright, radio and television broadcaster and musician. 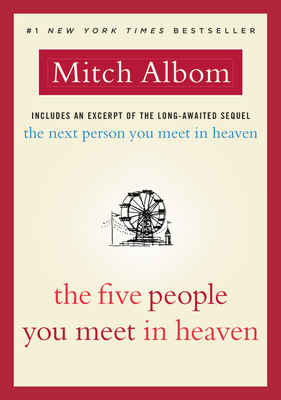 ?The 5 People You Meet In Heaven? is fictional, and philosophical. It really grabbed my attention because of how adventurous and mysterious it was. I always wanted to know more about the new environment Eddie encountered, and who he was going to meet next. It was very interesting and creative how Mitch put the story together. He explained Eddies life in a way in which it easily pieced together. It had a lot of readability, and it he had great choice of adjectives. Although it is about Heaven, there are few references to God. It?s not a religious book, but a great novel I really enjoyed reading. It forced me to think about who I would meet in my Heaven, and whose Heavens I would be apart of, if Heaven was anything like what Mitch explained. I let my mind ponder this question, and think of all kinds of things about the Afterllife. I recommend this book to anyone looking for an easy-to-read, heart-touching story. Very very good read. Very well written. And made me cry. Beautiful. Wonderful, wonderful message in the book that will always stay with me. Great book! EVERONE should read! This should be rated 10 stars!! but lacked content. The story begins with a death and afterdeath experience. After the first chapter the action/drama goes flat and the other 90% of the book is more or less character reflection. The idea of meeting five different people in heaven that had an influence on your life seemed intriquing. Sort of a "Night before Christmas" meets death, story line. This book doesnt pull it off however. Would be a great first draft. There is way too much non-important detail and not enough depth in character formation. Your left with trying to piece the story together from long stretches of endless memories. The end was very anti-climatic. I got to the last page and thought "this is it?????"